Yesterday was my parent’s 30th wedding anniversary, and as such, I did not count the calories I ate. Because both parents had to work, I wanted to make them a meal of restaurant quality. I had debated between something more of comfort food, or something more like a steakhouse, and chose the steakhouse because I knew it had been a while since they ate red meat (like myself, they eat a lot of chicken, turkey and pork). I wanted to get a picture of everything before dinner, but it seemed like my parents were hungry, and I was only able to get a picture of the leftovers. But it has a little bit of everything! The Steak was a Delmonico, which I seasoned with salt & pepper, a touch of garlic and onion powder, and a ½ cup of Lawry’s Steakhouse Marinade (it was for 4 steaks). I’m not a big fan of too much marinade, so that’s why I only chose to use a little bit. It was enough to add some flavor, but not too much that it overpowered the meat. I cooked it using Alton Brown’s Fill-Up-Your-House-With-Smoke method of cooking steaks, which involves preheating your oven to a sweltering 500 degrees, searing the steak on both sides using a screaming hot cast iron pan for 1 minutes on each side, then putting it in the oven for 4 minutes, flipping the steaks halfway through. After taking them out of the oven, put the steaks directly on a cooling rack and cover loosely with foil to let it rest. Very short cook time, and it gets the steak to a wonderful medium redness. The Asparagus was trimmed, and tossed in lemon olive oil, garlic powder, onion powder, salt & pepper. I roasted it in a 425 degree oven for 10 minutes, making sure to turn the asparagus about halfway through so it got even color. The lemon olive oil is from a local seller who makes all sorts of specialty oils and vinegars, and it was very tasty. Still had the fruitiness you expect from good olive oil, but with that hint of lemon. So good! The shrimp were the frozen, de-veined kind, so I let them thaw while I was prepping other things and then de-shelled them. I sprayed them with a bit of vegetable cooking spray and seasoned them lightly with garlic powder, onion powder, salt & pepper. When it was time to cook them, I just fried them in a medium heat frying pan until they were cooked through. The potatoes were the only thing I didn’t really have any prep for, as they were the boxed potatoes you find in the supermarket that you add butter and milk to, and bake for 30 minutes. 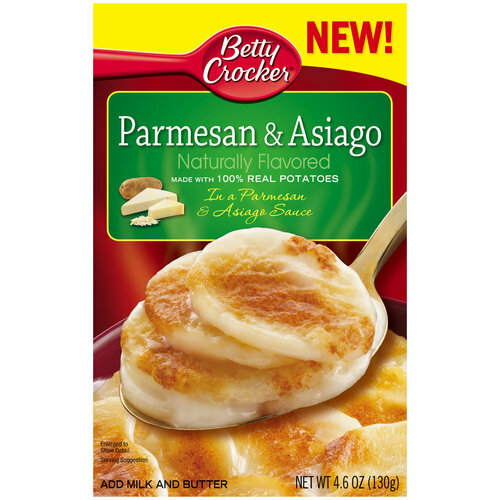 I believe this brand was Betty Crocker, and it was the parmesan and asiago cheese version, which turned out to be very tasty! One can’t have a dinner like this without a homemade dessert to go with it! I know both my parents love special dark chocolate, so I decided to make them homemade special dark chocolate brownies. The recipe for this is almost as easy as a box mix! Several years ago I discovered it on Food.com, and have not looked at any other recipe since! It’s called a Whatever Floats Your Boat Brownie, because you can really add whatever you like to them! 1-2 cups of whatever you like in your brownies, I used Special Dark Chocolate Chips, but nuts, raisins, marshmallows, m&m’s, etc., they all work well in this recipe! These brownies are also very good without any additions, so it is really whatever you choose! Stir in flour, vanilla and salt just until you do not see any more flour, do not over mix! Fold in whatever additions you choose! Spread the batter into the greased 9x13 pan, and bake for approximately 30 minutes. Do not over bake! A toothpick inserted should have moist crumbs but no batter. This recipe makes deliciously fudgy brownies that melt in your mouth and taste like they took hours to prepare! I’ll admit I ate two of them >.< I had brought vanilla ice cream with me to serve with them, but the brownies stood on their own, and didn’t need it. I’m back on track counting my calories for today, and you’ll see that in my diary tomorrow. I find that days of not counting are a welcome distraction every once in a while. It takes the pressure off of always having to monitor everything. I also find that as long as I continue to watch my portions, I generally don’t see too much fluctuation in the scale, which makes me feel good that I can do this when I hit goal, and won’t be monitoring my calories as rigidly. Yesterday was a special occasion, and there will be other special occasions in my future. As long as not counting is reserved for those special occasions, I am confident that my weight will continue to go down! !